The 2018 Royal Adelaide show was a resounding success for Victorian breeder Scott Bruton of Roly Park Beef and Australian Shorthorns. For the first time (as was at the Sydney Royal Easter Show) Beef, Australian and Poll Shorthorns were exhibited in the same ring. With 6 exhibits Scott was awarded the Senior Champion Female, Reserve Senior Champion Female, Senior Champion Bull, Breeders Group, placed 2nd in the Male & Female pair, placed 3rd in the Pair of bulls and placed 2nd in the pair of heifers. 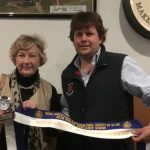 Pictured above is Biddy Ashby (Bundaleer Shorthorns) presenting Scott with the inaugural Graham Ashby Most Successful Exhibitor award and ribbon.